The Triassic period is an interval of about 51 million years defined on the geologic time scale as spanning roughly from 251 to 200 million years ago (mya). The period is noteworthy for a great increase in the biodiversity of both marine and continental life, beginning from the starkly impoverished biosphere that followed the Permian-Triassic extinction. Corals of the hexacorallia group make their first appearance. The first flowering plants (Angiosperms) may have evolved during the Triassic, as did the first flying vertebrates, the pterosaurs. The extinction event that closed the Triassic period was the Triassic-Jurassic extinction event. As the first of three periods of the Mesozoic era, the Triassic period lies between the preceding Permian period, which ended the Paleozoic era, and the following Jurassic period. The Triassic period laid the foundation for subsequent stages of life, including the dominance of dinosaurs seen during the Jurassic and Cretaceous periods. The Triassic period was named in 1834, by Friedrich Von Alberti from the three distinct layers—red beds, capped by chalk, followed by black shales—found throughout Germany and Northwest Europe and called the "Trias" (Latin trias, meaning triad). During the Triassic, almost all the Earth's land mass became concentrated into a single supercontinent, centered more or less on the equator, called Pangea ("all the land"). This supercontinent included an East-facing Tethys sea, a vast gulf that opened farther westwards in the mid-Triassic at the expense of the shrinking Paleo-Tethys Ocean, an ocean that existed during the Paleozoic. The remainder was the world-ocean known as Panthalassa ("all the sea"). All the deep-ocean sediments laid down during the Triassic have disappeared through subduction of oceanic plates; thus, very little is known of the Triassic open ocean. 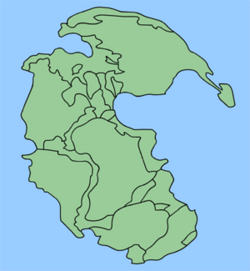 The supercontinent Pangaea was rifting during the Triassic, especially late in the period, but had not yet separated. The first marine and nonmarine sediments in the earliest rift (separating present-day "New Jersey" from "Morocco") are Late Triassic in origin. In the United States, these thick sediments comprise the Newark Supergroup. Because of the limited shoreline of one super-continental mass, Triassic marine deposits are relatively rare on a global scale, despite their prominence in Western Europe, where the Triassic was first studied. In North America, for example, marine deposits are limited to a few exposures in the West. Thus Triassic stratigraphy is mostly based on organisms, such as Estheria crustaceans, living in lagoons and hypersaline environments. The Triassic climate is considered to have been generally hot and dry, forming typical red bed sandstones and evaporites. There is no evidence of glaciation at or near either pole; in fact, the polar regions were apparently moist and temperate, a climate suitable for reptile-like creatures. Pangea's large size limited the moderating effect of the global ocean; its continental climate was highly seasonal, with very hot summers and cold winters (Stanley 1999). It probably had strong, cross-equatorial monsoons (Stanley 1999). Three categories of organisms can be distinguished in the Triassic record: Holdovers from the Permian-Triassic extinction (P-T extinction), new groups that flourished briefly, and other new groups that went on to dominate the Mesozoic world. In marine environments, new, modern types of corals appeared in the Early Triassic, forming small patches of reefs—to a modest extent when compared to the great reef systems of Devonian times or modern reefs. The shelled cephalopods called ammonites recovered, diversifying from a single line that survived the Permian extinction. The fish fauna was remarkably uniform, reflecting the fact that very few families survived the Permian extinction. There were also many types of marine reptiles. These included the Sauropterygia, which featured pachypleurosaurs and nothosaurs (both common during the Middle Triassic, especially in the Tethys Ocean region), placodonts, and the first plesiosaurs (members of a diverse and primarily marine order of reptiles). Other marine reptiles included the first of the rather lizardlike Thalattosauria (Askeptosaurs), and the highly successful ichthyosaurs, which appeared in Early Triassic seas and soon diversified, some eventually developing to huge size during the late Triassic. On land, the holdover plants included the lycophytes, the dominant cycads, ginkgophyta (represented in modern times by Ginkgo biloba), and glossopterids. Seed plants dominated the land. In the northern hemisphere, conifers flourished. Glossopteris (a seed fern) was the dominant southern hemisphere tree during the Early Triassic period. Temnospondyl amphibians were among those groups that survived the P-T extinction, some lineages (for example, Trematosaurs) flourishing briefly in the Early Triassic, while others (such as Capitosaurs) remained successful throughout the whole period, or only came to prominence in the Late Triassic (for example, Plagiosaurs, Metoposaurs). As for other amphibians, the first Lissamphibia are known from the Early Triassic, but the group as a whole does not become common until the Jurassic, when the temnospondyls had become very rare. Archosauromorph reptiles—especially archosaurs—progressively replaced the synapsids that had dominated the Permian period. Although Cynognathus was a characteristic top predator in earlier Triassic (Olenekian and Anisian) Gondwana, and both Kannemeyeriid dicynodonts and gomphodont cynodonts remained important herbivores during much of the period. By the end of the Triassic, synapsids played only bit parts. During the Carnian (early part of the late Triassic), some advanced cynodont gave rise to the first mammals. At the same time, the Ornithodira, which until then had been small and insignificant, evolved into pterosaurs and a variety of dinosaurs. The Crurotarsi were the other important archosaur clade, and during the Late Triassic these also reached the height of their diversity, with various groups including the Phytosaurs, Aetosaurs, several distinct lineages of Rauisuchia, and the first crocodilians (the Sphenosuchia). Meanwhile the stocky herbivorous rhynchosaurs and the small to medium sized insectivorous or piscivorous Prolacertiformes were important basal archosauromorph groups throughout most of the Triassic. Among other reptiles, the earliest turtles, like Proganochelys and Proterochersis, appeared during the Norian (middle of the Late Triassic). The Lepidosauromorpha—specifically the Sphenodontia—are first known in the fossil record a little earlier (during the Carnian). The Procolophonidae were an important group of small lizard-like herbivores. The Monte San Giorgio lagerstätte (sedimentary deposits that exhibit extraordinary fossil richness or completeness), now in the Lake Lugano region of northern Italy and Switzerland, was in Triassic times a lagoon behind reefs with an anoxic bottom layer. Therefore, it is assumed there were no scavengers and little turbulence to disturb fossilization, a situation that can be compared to the better-known Jurassic Solnhofen limestone lagerstätte. The remains of fish, and various marine reptiles (including the common pachypleurosaur, Neusticosaurus, and the bizarre long-necked archosauromorph Tanystropheus), along with some terrestrial forms like Ticinosuchus and Macrocnemus, have been recovered from this locality. All these fossils date from the Anisian/Ladinian transition (about 237 million years ago). The Triassic period ended with a mass extinction, which was particularly severe in the oceans; the conodonts disappeared, and seemingly all the marine reptiles except ichthyosaurs and plesiosaurs. Invertebrates like brachiopods, gastropods, and mollusks were severely affected. In the oceans, 22 percent of marine families and possibly about half of marine genera vanished. Though the end-Triassic extinction event was not equally devastating everywhere in terrestrial ecosystems (see below), several important clades of Crurotarsi (large archosaurian reptiles previously grouped together as the thecodonts) disappeared, as did most of the large labyrinthodont amphibians, a number of groups of small reptiles, and some synapsids (except for the proto-mammals). Some of the early, primitive dinosaurs also went extinct, but other, apparently more adaptive dinosaurs survived to evolve in the Jurassic. Surviving plants that went on to dominate the Mesozoic world included modern conifers and cycadeoids. It is not certain what caused this Late Triassic extinction, which was accompanied by huge volcanic eruptions about 208-213 million years ago, the largest recorded volcanic event since the planet cooled and stabilized, as the supercontinent Pangaea began to break apart. Other possible causes for the extinction events include global cooling or even a bolide (meteor) impact, for which an impact crater surrounding Manicouagan Reservoir, Quebec, Canada, has been singled out. At the Manicouagan impact crater, however, recent research has shown that the impact melt within the crater has an age of 214±1 mya. The date of the Triassic-Jurassic boundary has also been more accurately fixed recently, at 202±1 mya. Both dates are being refined by using more accurate forms of radiometric dating, in particular the decay of uranium to lead in zircons formed at the impact. So the evidence suggests the Manicouagan impact preceded the end of the Triassic by approximately 12±2 mya. Therefore, it could not be the immediate cause of the observed mass extinction (Hodych and Dunning 1992). The number of Late Triassic extinctions is disputed. Some studies suggest that there are at least two periods of extinction toward the end of the Triassic, between 12 and 17 million years apart. But arguing against this is a recent study of North American faunas. In the Petrified Forest of northeast Arizona there is a unique sequence of latest Carnian-early Norian terrestrial sediments. An analysis in 2002 found no significant change in the paleoenvironment. Phytosaurs, the most common fossils there, experienced a change-over only at the genus level, and the number of species appears to have remained the same. Some Aetosaurs, the next most common tetrapods (four-legged vertebrates), and early dinosaurs, passed through unchanged. However, both Phytosaurs and Aetosaurs were among the groups of archosaur reptiles completely wiped out by the end-Triassic extinction event. These extinctions within the Triassic and at its end allowed the dinosaurs to expand into many niches that had become unoccupied. Dinosaurs would become increasingly dominant, abundant, and diverse, and remained that way for the next 150 million years. The true "Age of Dinosaurs" took place over the Jurassic and Cretaceous periods, rather than the Triassic period, which instead laid the foundation for the dinosaur era. ↑ McElwain, J.C. and Punyasena, S.W. (2007). Mass extinction events and the plant fossil record. Trends in Ecology & Evolution 22 (10): 548-557. ↑ Retallack GJ Veevers JJ & Morante R (1996). Global coal gap between Permian–Triassic extinctions and middle Triassic recovery of peat forming plants. GSA Bulletin 108 (2): 195–207. ↑ Payne, J.L. and Lehrmann, D.J. ; Wei, J.; Orchard, M.J.; Schrag, D.P. ; Knoll, A.H. (2004). Large Perturbations of the Carbon Cycle During Recovery from the End-Permian Extinction. Science 305 (5683): 506. ↑ Columbia University, Lecture 10. Retrieved September 7, 2007. ↑ Adrian P. Hunt, Spencer G. Lucas, Andrew B. Heckert, and Kate Zeigler, No Significant Nonmarine Carnian-Norian (Late Triassic) Extinction Event: Evidence from Petrified National Forest. Retrieved September 7, 2007. Emiliani, C. 1992. Planet Earth: Cosmology, Geology, and the Evolution of Life and Environment. Cambridge: Cambridge University Press. ISBN 0-521-40949-7. Ogg, J. 2004. Overview of Global Boundary Stratotype Sections and Points (GSSP's). Retrieved September 7, 2007.
van Andel, T. 1985. New Views on an Old Planet: A History of Global Change. Cambridge: Cambridge University Press. This page was last modified on 1 December 2008, at 13:58.